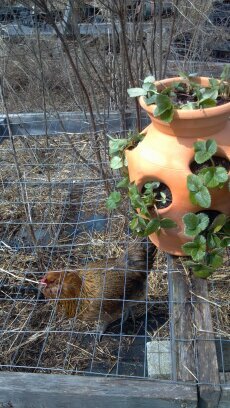 It was March and kind of cold and a customer brought in a strawberry jar for me to plant. In a former life, strawberry jars never thrived. I held a grudge against them. This was not a product I ever planned to carry when I owned my own garden center. But people started bringing them to me, whimpering and teary because they had taken a class and spent all this time drilling holes in a pipe and did everything and it still died. I planted them and didn't hear back from anyone. As I dissected the remains (They brought them still intact) I was amazed and bewildered at the work these people had put into their planters. This was a group of people who LOVED their jars. Then came that lady in March with that great, big, 3 gallon thing. The others had all been one gallon jars - I guess they all took the same class. I turned her down. She begged. I told her not to hope for much. She said she'd be back in two weeks. I didn't have a pipe and I had always taken them out of the others anyway. Also didn't have a drill. At the first garden center where I worked we stuffed them with sphagnum, but I didn't have that either. 1) Put an empty paper towel tube into the center and fill it with perlite. 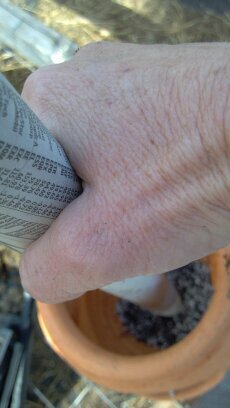 2) Fill the bottom up to the first set of holes with potting soil. 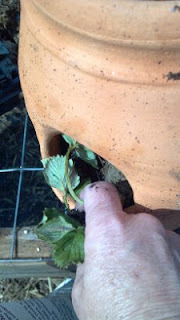 3) Put the plant in the center of the pot and gently entice it through an opening in the first row. 4) Repeat for all the holes in that row. 5) Cover their root balls with soil and sprinkle some pelleted fertilizer on them. 6) Repeat for all rows around the sides - but not the top. 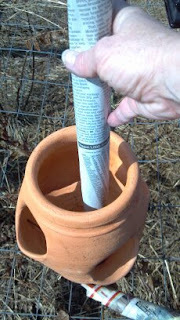 7) When the soil gets almost level with the top of the tube, gently tap/wiggle/Harlem Shake the tube while you lift it. The perlite should fall out. 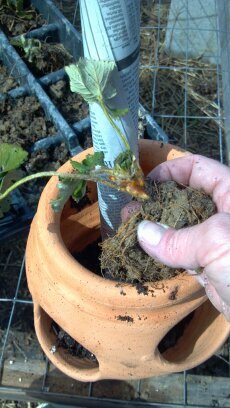 The tube should come up empty, leaving a perlite core through the center of the planter. If the jar is tall, you may have to shake and lift the tube and fill it with perlite again half way through the process. I had an employee who used a wrapping paper tube for a huge strawberry jar at her house. She left the paper tube in the planter and it still grew well. The woman didn't come back and the strawberry jar thrived all summer. We added strawberry jars to our inventory and sold plenty. All planted like the "display." On the last Saturday of August we held a gardening seminar. We sold out of strawberry jars and I reluctantly agreed to sell the "display." I had called the woman regularly and she hadn't ever called back. The pot was too big to keep in to greenhouse over the winter. And the next shipment of pottery would arrive in three days. I was so sure we'd get caught, we ran with it to her car. The next day - the owner showed up.